Satan have premiered a new song titled “Death Knell For A King.” This track is from the band’s new album “Cruel Magic,” which will be released on September 7. Satan have premiered a new video for their new song “The Doomsday Clock.” This track is from the band’s new album “Cruel Magic,” which will be released on September 7. More bands have been added to the 2016 Maryland Deathfest. The festival will take place May 26-29 in Baltimore, MD at the Edison Lot, Rams Head Live & Baltimore Soundstage, and the newly announced acts include: The Afternoon Gentlemen, Buzzov*en, Centinex, Claudio Simonetti’s Goblin, Crypt Sermon, Dehumanized, Demonical, Demonic Christ, Deranged, Discharge, DOOM, Dopethrone, Dragged Into Sunlight, Gets Worse, Ground, Hellbringer, Hirax, Horrendous, Infest, Interment, Magrudergrind, Novembers Doom, Nuclear Assault, Paradise Lost, Priapus, Putrescence, Repulsion, Ringworm, Rotten Sound, Satan, Secrets Of The Moon, Severed Head Of State, Sick Fix, Sick Of Stupidity, Six Brew Bantha, Skullshitter, Tempest, Test, Testament, Tragedy, Waco Jesus, Weedeater, Whoresnation, Wombbath, and World Burns To Death. 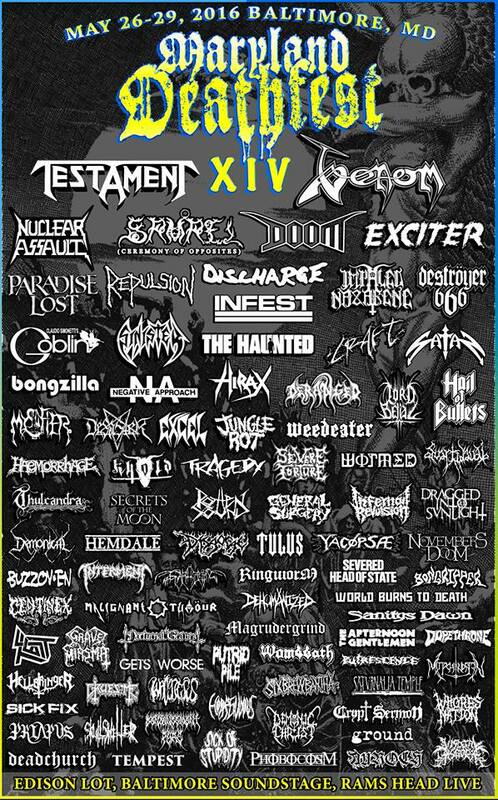 Previously announced acts include: Auroch, Bongripper, Bongzilla, Denouncement Pyre, Deströyer 666, Disgorge, Exciter, Gruesome, Haemorrhage, Hail of Bullets, The Haunted, Jungle Rot, Khold, Lord Belial, Malignant Tumour, Mitochondrion, Nocturnal Graves, Phobocosm, Putrid Pile, Samael (“Ceremony Of Opposites” set), Saturnalia Temple, Severe Torture, Sinister, Svartidauði, Svarttjern, Thulcandra, Tulus, Venom, Visceral Disgorge, Wormed, Craft, Dead Church, Desaster, Excel, General Surgery, Grave Miasma, Hemdale, Impaled Nazarene, Infernal Revulsion, Mystifier, Negative Approach, Sanitys Dawn,and Yacøpsæ.